So we decided Ash needed to have a Doctor Who themed going-away party. I hung styrofoam galaxies in the hall and made a bleach and paint splattered galaxy-ish tablecloth, and made a bunch of fezzes for people to wear, because everyone knows that parties are more fun when they include amusing and thematic attire. Plus fezzes are cool. 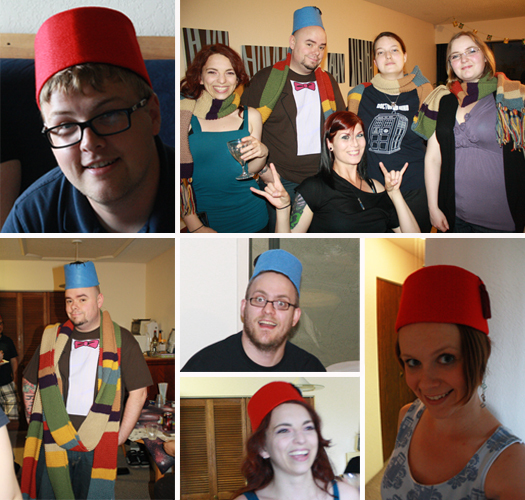 Throughout the evening, various people wore various fezzes as we enjoyed various Doctor Who drinks and jokes. 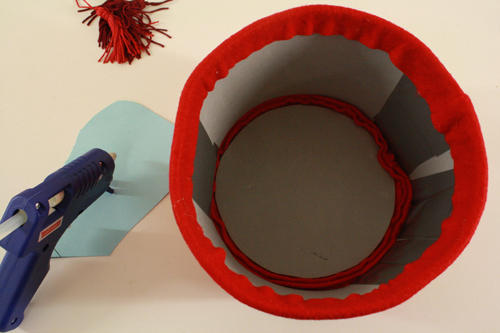 All this party prep and fez-making is a large part of why I was too busy to post an actual tutorial last week, but now I will start making it up to you by teaching you how to make a simple, inexpensive felt fez. felt – any colour! A lot of fezzes are red. A lot of trees are also green, but that just makes the pink ones even more noteworthy and special. You’ll need about 1/8 to 1/4 yard of material. 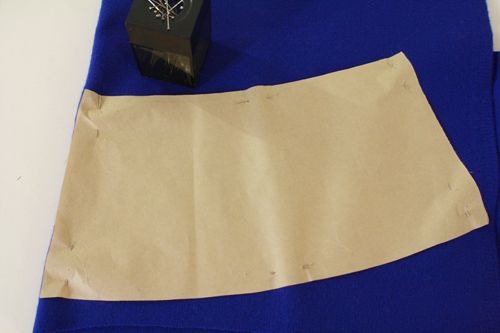 1) Start by printing the fez pattern onto plain printer paper and cutting it out. The pattern is two pages, so you’ll need to connect them. Just match up the edges exactly (use the lines marked A and B on pattern piece B) and tape them together. Match the edges of the paper, not the edges of the image, which may get partially cut off by print margins and stuff. 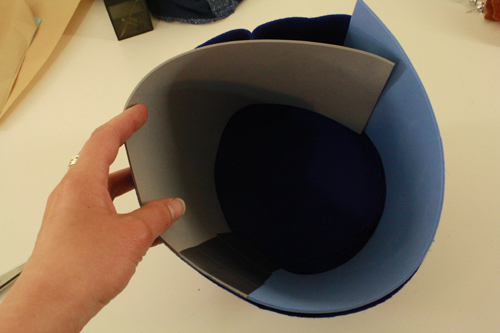 This pattern is sized small to medium, and you lose some circumference towards the end of the process, when you fold and glue the bottom felt edges inside the hat. Fezzes do look fine fit onto a head or just perched on top of it (as demonstrated in the photos above), but if you want to increase the size of your fez, I’ve provided a pattern piece for that – piece C. Just cut it out and tape it to one end of piece B to add to the circumference of your hat. 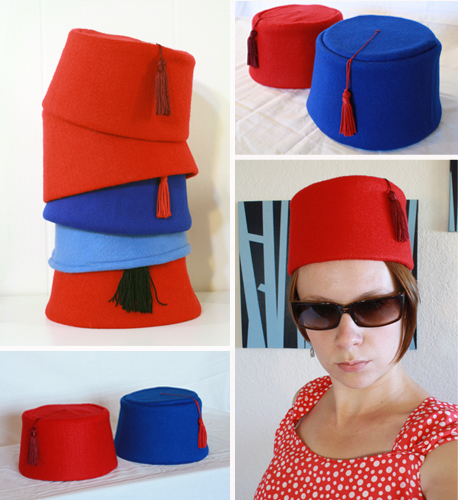 You can trim it down to add only a slight amount of hat size, or increase it even more for a much larger fez. Just keep in mind that you’ll also need to increase the size of your hat’s crown (the circle that makes up the flat top of the hat) accordingly. 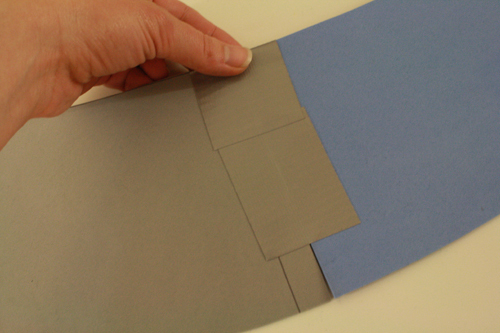 2) Take your piece of felt and fold it in half. Line up one end of pattern piece B along the folded edge of the felt, and pin the pattern into place. Pin pattern piece A onto the felt as well. 3) Cut the pieces out. 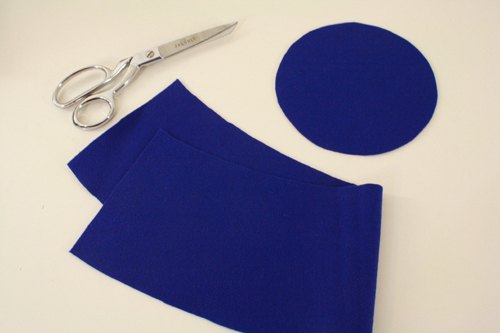 4) Fold the felt cutout of pattern piece B in half, matching up the ends. Pin the ends together. 5) Sew along the pinned edge, matching the edge of the fabric up with the edge of your presserfoot for an approximate 3/8″ seam allowance. 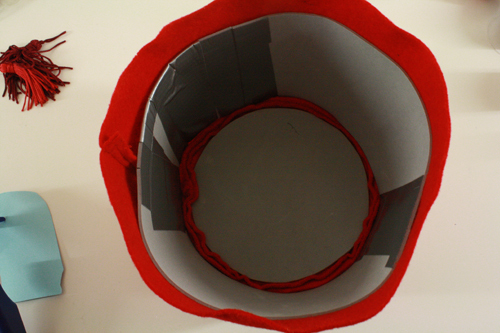 6) Now take your circular felt cutout of pattern piece A and set it on top of the fez, inside the circle of fabric. 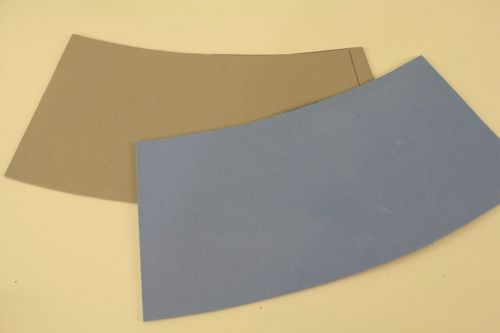 Pin the edges of both pieces together, all the way around the circle. You can tell where the fez’s top is because it should be slightly smaller than the bottom, since fezzes flare outwards from top to bottom. 7) Now sew all the way around the circle. Keep the edge of your presserfoot lined up with the edge of the fabric to get the right seam allowance and create an evenly rounded line of stitching. 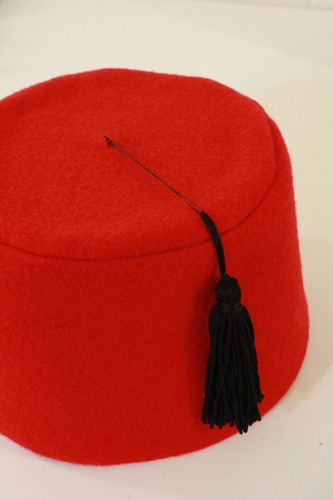 You’ll want to sew this with the round circle part facing down, lying along your sewing machine, and the “body” of the fez pointing upwards into the air. If you’ve been hanging around here for a while, you might remember that this is exactly the same thing we did to attach fleece pig faces to bodies (step 3 of that tutorial) and to create the bottoms of dice bags (step 8 of that tutorial). 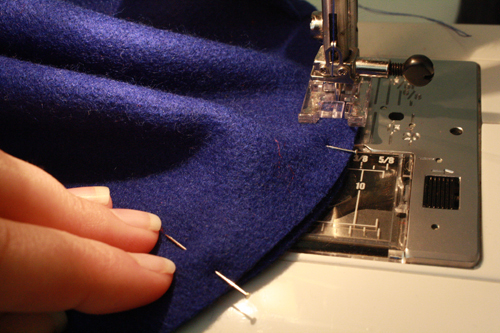 If you’re not too familiar with sewing, just keep in mind that you can always stick your needle down into the thread, lift the presserfoot up, and turn the fabric underneath a bit to adjust your direction, then put the presserfoot back down and resume stitching. 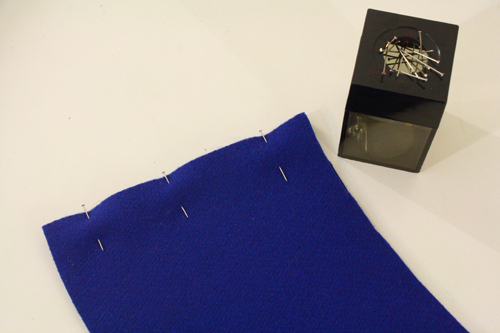 This is how you turn tight corners, change direction and follow jagged or tightly curved lines on a sewing machine. 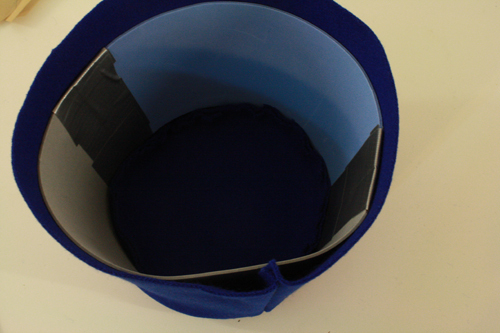 I go over this in a bit more detail (with pictures) in my Zelda hat tutorial (step 8 of that tutorial). 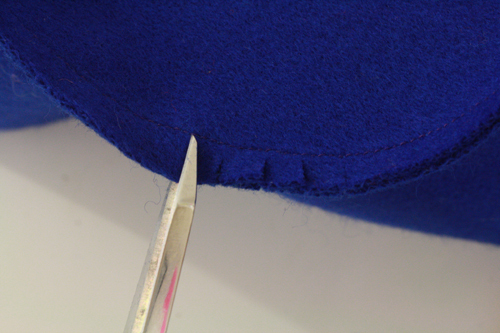 8) Using a good pair of sharp scissors, cut little slits all the way around the circle you’ve just sewn, going up to the line of thread, but not cutting through it. You’ll want to do this step very carefully. If you do accidentally snip through some thread, just go over that section of stitching again on your sewing machine – it’s not the end of the world, just a nuisance. Turn the whole fez right side out. It’s going to have a sort of roll-y, not-pushed-out look to it at the top. Moreso if you’ve used thicker, heavier material. That’s ok, that’s normal. That’s what the next steps are going to fix. 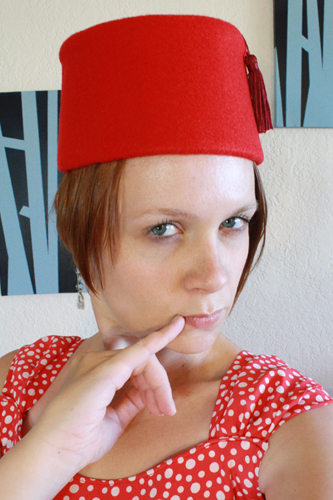 9) Print the fez pattern out again, this time onto cardstock. * This time, when you cut the pieces out, cut along the dashed line where there is such a line. 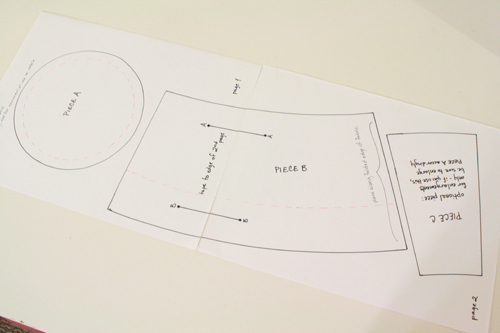 This means you’ll be cutting out a smaller circle and and a narrower long piece. *Not strictly necessary, it just makes the pattern pieces easier to trace onto the foam or cardboard. 10) Turn on your hot glue gun. While the glue gun is warming up, trace the new pattern pieces onto your craft foam or cardboard. For piece B, you can’t really fold the foam or cardboard in half (and shouldn’t anyway), so just trace it twice and cut out two separate pieces. It’s likely your foam or cardboard won’t be long enough for you to do otherwise anyway. The reason I recommend the foam (which you can get at stores like Michael’s or Hobby Lobby – it’s just super thin coloured rubber foam) over cardboard, is that it creates a smoother exterior for the fez. Cardboard never curves quite smoothly, so your fez will probably have some slight lines along its outside if you use cardboard. However, when I say slight I really do mean slight – it will in no way ruin the overall look of your fez, so there is no reason to go to any great lengths or costs or inconvenient trips to the craft store just to avoid using cardboard for this. I did fezzes both ways and they all turned out perfectly wearable. 11) First, take your fez and turn it upside down, then take your foam or cardboard circle and push it down into the top of the fez. 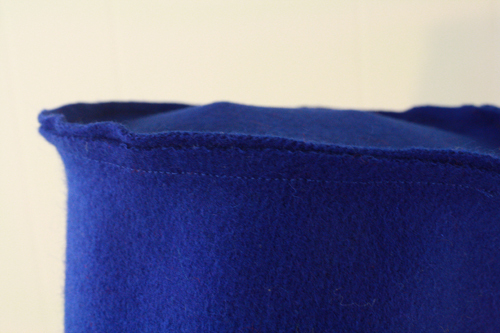 With some pulling and adjusting, it should fit inside the round seam of fabric at the top of the hat. If it doesn’t, take it out and trim it down slightly around the edges until it fits. 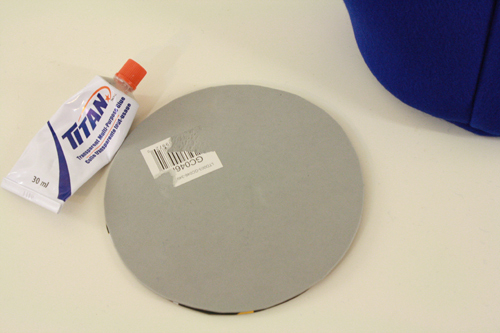 Once you’re sure it fits, dab a little hot glue around the edges of the circle and insert it into the hat, pressing down to get the hot glue to go flat and hold the circle in place. 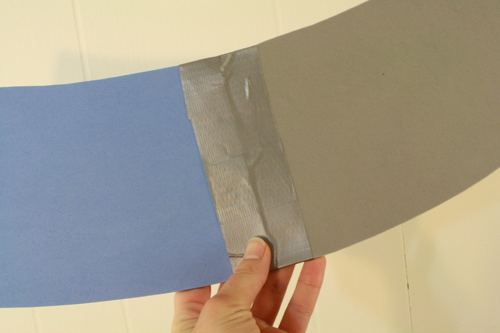 12) Now take those two copies you cut of piece B, match up two of the ends of the pieces exactly, and tape them together on both sides with duct tape or packing tape. 13) Now take this piece and fit it inside the fez. 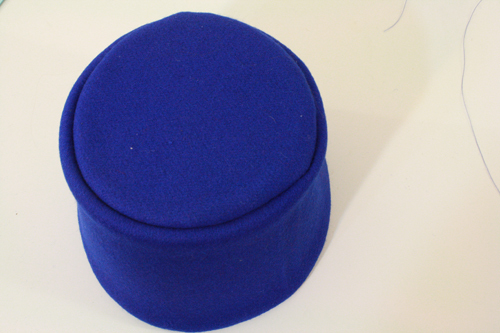 Push it all the way down to the top of the hat, and push it outwards so that it takes up as much space as possible, pushing the sides of the fez outward as much as possible. If the untaped ends of the foam overlap, make a little mark where they overlap. 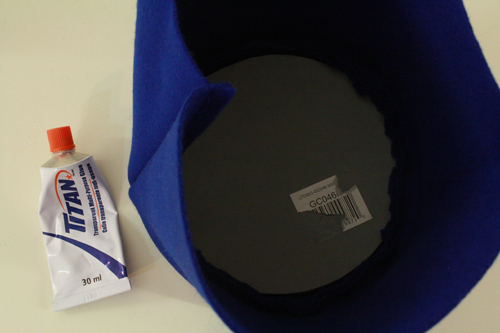 Also, when the foam is inside the hat, it should be about an inch shorter than the felt body of the hat. If it sticks out (like in the photo below) you’ll need to trim it. I’ve adjusted the pattern since making the fez in the picture below, so this shouldn’t be a problem for you, but if it is, just cut the foam down a bit. 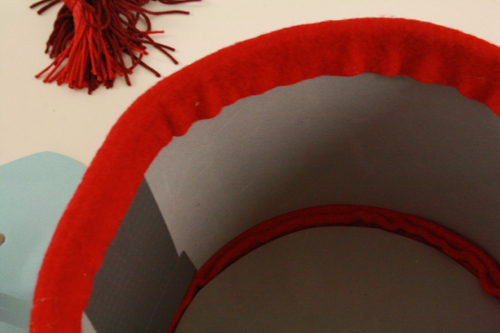 14) Pull the foam back out of the fez and trim any excess at the ends, where you made the pen mark. 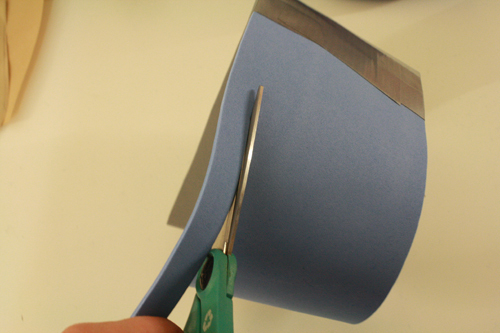 If your foam was too short, you’ll need to cut another small segment (just use the original template for this) and tape it to the existing piece to lengthen it. 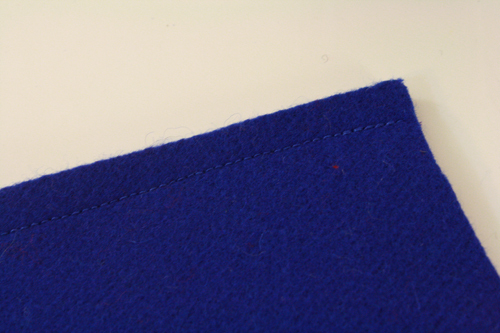 Similarly, if the foam stuck out above the edge of the felt, you’ll want to cut it short along the bottom edge. 15) Now you can match up the open ends of the foam circle and tape them together. Then push the whole thing back inside the fez and adjust until it’s sitting in there nice and evenly. 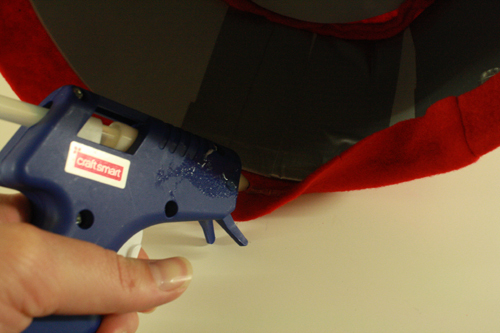 Grab your glue gun again, and make a line of glue a few inches long along the exposed bottom edge of the felt. Then pull the felt tightly over the bottom edge of the foam and press down. Try not to burn your fingers through the fabric. 17) Continue all along the bottom edge of the hat this way, until the felt all the way along is glued down inside the fez. 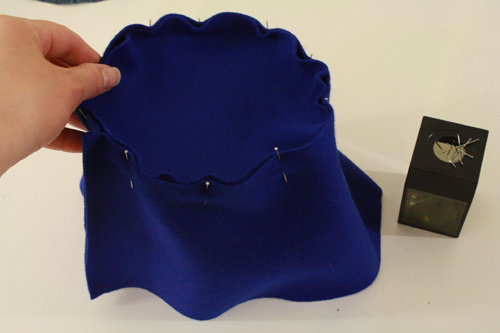 18) Let everything dry and cool, then flip the whole hat over and sew a tassel on the top. If, like me, your tassels are a bit short, you can leave an extra length of the thread that attaches them to the hat, so that they dangle further over the fez’s side. 19) Party time! Remind all your friends how cool fezzes are. If you have the right kind of friends, they should already know this. For even more coolness, add a bowtie. I unfortunately did not have time to make bowties for this party, but I’ll get to it eventually, and when I do there will be a tutorial for that, and possibly another party. I’ve got these little styrofoam planets around now after all – better just have another Doctor Who party in the future. Or the past. 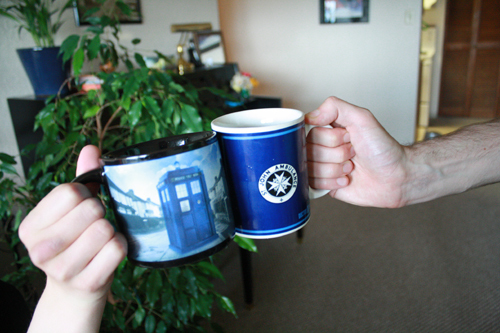 Whichever the Tardis lands us in. I wish I had seen this tutorial before my daughter’s birthday party last month. I guess there’s always next year. Aw. :( Here’s hoping you can make use of it next year! This is brilliant, and I wish we had planned ahead for a big Doctor Who premiere party at PAX this year. Thank you for such detailed instructions and pattern. You saved Halloween for my daughter! Thank you so much for the fez tutorial! Made them in time for my son’s Dr.Who party. Love them! Thank you for this tutorial. Just what I wanted for my daughter’s birthday party. How did you make your planets? 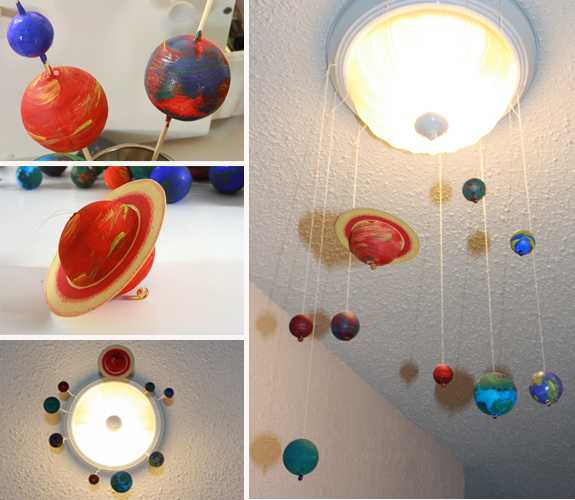 The planets I made by painting various sizes of styrofoam balls with acrylic paint, and sticking them on bamboo skewers to dry. Then (using the hole all the way through that the bamboo skewers made), I ran thread through each planet, then through a glass bead, then back up through the planet and used that to hang them. The bead kept planet from just sliding off the thread. Thanks! This is just what I needed. I already bought supplies to make my husband a Fez for our Dr Who event and I was going to just ‘wing’ it and make it up as I go but your pattern and techniques will most likely save me possible aggravation. I am glad I looked online before I started cutting my material. You kind of look like Donna!? Ya’ll take everyone’s culture and exploit or make a mockery of it, with no shame. First of all this is not a fez of any kind its just another form of mockery from the European for all you that call yourselves Moorish this or that should be offended. This is truly disrespectful to our Moorish crown. So all moors should voice there dislike and tell facebook to remove this from there site. To Malik & Christopher, I appreciate the input, but this is simply a fun little tutorial for a specific type of headgear worn on the BBC television program, Doctor Who, and the project and tutorial were done in honour and appreciation of the show. It is certainly not meant to offend or exploit anyone, and I personally feel that equating it to insensitivity about those of Moorish ancestry is stretching things somewhat. If you really do feel strongly about this, it would probably be a matter best taken up with the BBC and the creators of Doctor Who. and also, we don’t mean to offend anyone, but i guess some people might take this as an insult, so sorry if you are offended. i had to hand- sew ALL of this, because i thought i had a sewing machine in my basement :/ turns out i didn’t, but my fez looks awesome so far! thanks for the tutorial! How can I print the pattern? I’ve tried everything, and I just can’t figure it out. I’m on a mac if that makes a difference. Please help! 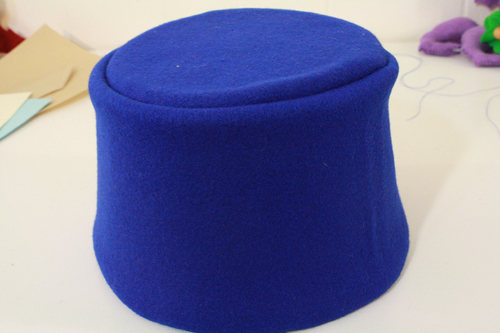 Any idea how much to increase the diameter of the crown of the fez if I want to use piece C to increase the size? I just like the valuable information yoou suoply to your articles. I’ll bookmark your blog and test once mkre right here frequently. I am fairly sure I will learn a llot of new stuff propr right here! This is awesome. My son wants one for a Lego group he will be judging. But he has an extra extra large head, 25 inches around. How do I print out the pattern, and how can I enlarge it that much? But should commentary on some general issues, The site style is perfect, the articles is really nice : D.
Yes yes yes! Just what I was looking for as I prepare my daughter’s 6th birthday party. (She actually wanted a Weeping Angels party, but I thought that might spook her fellow kindergartners). 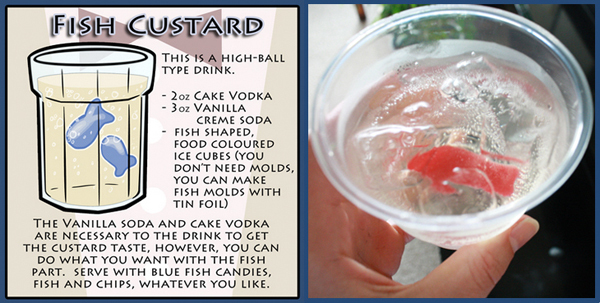 Anyway I could pay you to make me 25 of these for a kids field day? di una certa età, sei davvero nel posto giusto. Thank you so much for the free fez pattern. It is exactly what I needed to finish my daughters Dr. Who costume! THANKS! Thanks for the great tutorial. Fez is ready for Halloween! TARDIS. Light-Up Fez. You’re Welcome. Help Your Mind Get Bigger On The Inside With This Awesome Doctor Who Tardis Fez!! 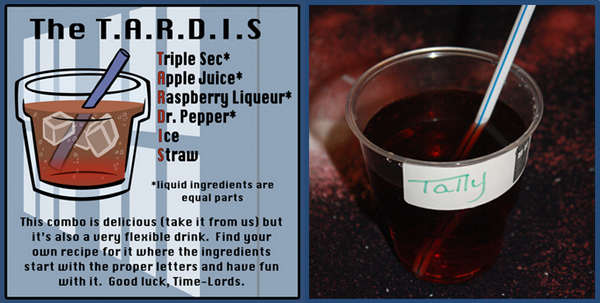 How to Throw A Doctor Who Party | Happy. Pretty. Sweet.